My friend Melissa and I were in a two-week class together earlier this month. Over and over again, she affirmed me, bragged on me, encouraged me, and told me that cool things happen to me. What a friend! And she knows about cool things because she’s genuinely and authentically a cool person—I’m blessed to be in her circle. I’m better for it. She told me something one day over lunch that’s stuck and skipping on repeat in my head. Something so simple that it can only be the most beautiful kind of truth: give your best to others, and good comes back to you. It’s a Golden rule. And it IS true, if for no other reason than the fact that if you’re doing good, helping others, and sharing, then your outlook on life is golden-tinged. It’s not a magic trick, but it is a holy sort of practice. My Uncle John’s taught me a lot about living, just through the way he chooses to live his life. If I could write a person’s biography, it’d be his (followed closely by my brother who at one time ran away and joined the circus). Uncle John, my dad, and their other four sisters and brothers grew up in Mudsoc, Ohio. It’s simply a crossroads—C.B. Drummond’s general store and the United Methodist church across the street. Both are closed now, their roofs bowed down and tired. Until high school, the Brown family attended classes a two-room schoolhouse. The family walked to the little clapboard church up on the hill past the Fraley’s farm, they played baseball in field so tiny that left field was down a hill, they grew tobacco, they transformed the old barn into a basketball arena one night with bushel baskets for hoops. These details were my favorite nightime stories—it was as if my dad and his family grew up in another time. Which, mostly, they did. Evidence of this is found in the fact that the Amish have now moved into the valleys and nooks around Mudsoc, the farmland is ideal for their simple kind of living. So here is this guy: the product of Mudsoc, of this other time—my Uncle John. When I was little, I couldn’t wait for him to come visit, probably because Mom always promised me that when he got married, I’d be the flower girl at his wedding…I’m still waiting. But I also loved how excited and interested he was in whatever my brothers and I were doing. He was just so much fun to be around! When I was the grandmother in Buena Vista Elementary’s production of “Little Red Riding Hood”, I spotted him in the audience, and ran off the stage to give him a hug. He was the cool uncle for sure, off having adventures around the world. After opening restaurants in Washington, Wyoming, and California, he retired to a ranch in Todos Santos, Mexico on the Baja peninsula. About as far from Mudsoc as possible…but he still is connected to his home and his family. So many of his stories begin with “I have a friend in…” because he has friends all over the world. And they are his friend for the very same reason I thought he was so cool when I was a six year old—he gives his whole self: he’s interested in others, he’s generous, he’s enthusiastic. He’s a dreamer and a do-er. About a month ago, Uncle John was in Greenville visiting my mom and dad. I called up to say hello, and said some passing comment like, “Hey, Uncle John! Matthew and I are going on a road trip next month. Can we borrow the van?” We laughed—the bus was in Mexico. Crazy thought. 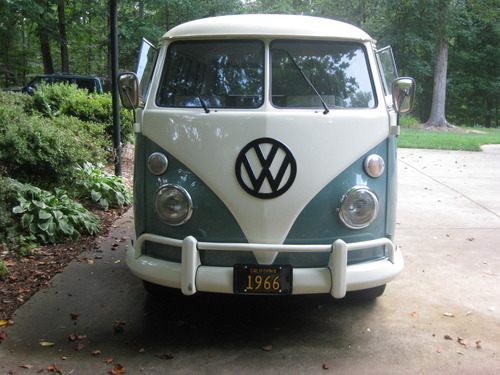 And then Uncle John drove the bus across the country—from the Pacific to the Atlantic—no air conditioning, no hesitation, and gave me my dream car. Yesterday, Matthew and I were so happy to show him around Charleston, introduce him to some of our dearest friends, and learn that we share a lot of the same interests. I’ll never forget trying to get the hang of driving the bus in my school parking lot, sweltering in the 105 degree heat index. If that’s not a bonding moment, I don’t know what is! Driving over the Sullivan’s Island causeway yesterday, looking back at my friends soaked in late evening sun, and Uncle John at the wheel—well, some moments ARE golden, aren’t they? The words “thank you” seem so flimsy and small in the face of that sort of generosity. The gift’s not just parked outside our apartment, it’s in what he’s taught me through this…and I hope to live the way he does: making friends everywhere, creating joy, and always looking for a new adventure.